This post contains a case study about a Media House located in Mumbai, India, with more than 500 employees. The company is an industry-leader in radio spot monitoring providing Sales, Marketing and Advertising Research tools to broadcasters, ad agencies, advertisers and industry analysts. Their patented broadcast monitoring technology reviews top-rated advertising media in major markets. The organization relies on a diverse workforce that works in multiple shifts round-the-clock to serve a global customer base and keep operations running smoothly at every hour of the day. 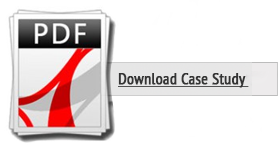 This Media House was using paper-based approach to manage multiple shifts, record employee work hours and it led to several challenges. Two years back, the company rented an office space in one of the most high-class suburban real estate properties in the city. A huge capital was invested in renting this work space and the Leadership expected high returns from this investment. Over 20 percent of work stations were unoccupied or used insignificantly leaving gaps in optimal utilization of resources. It was difficult to efficiently manage shifts for employees. This led to a fewer number of employees at some time and a larger employee population at other times. Managers needed an automated tool to know availability of employees in a specific shift and keep work stations optimally utilized. 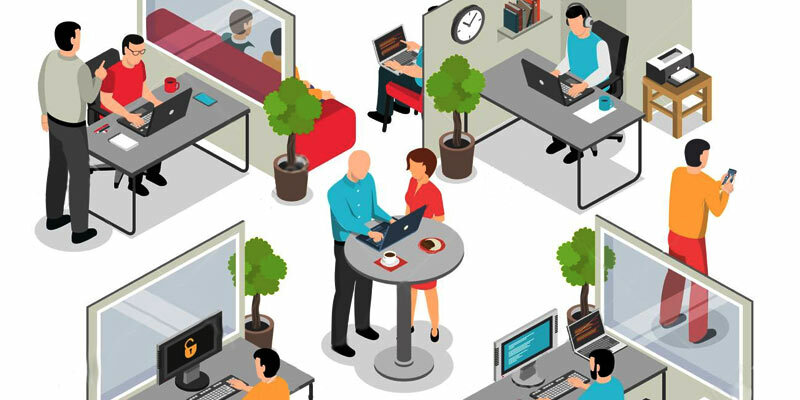 Since same work stations were used by employees in different shifts, each shared work desk needed to be freed by a specific time so that employee coming in the next shift could start using it the moment they started work. When employees needed to compensate short working hours, managers didn’t have data to identify available work stations in the specific shift. It was not possible to identify employees on leave, such that their work station could be re-assigned to other employees. Employees had no way to check number of short hours in a month, such that they could regularize them in a timely manner. These challenges were difficult to solve through a paper-based approach – as it was time consuming and had more chances of errors. The company discussed these challenges with Empxtrack Team, with an aim to cover loss of infrastructure costs, increase accuracy in real-time attendance data, improve employee productivity and boost overall business outcomes. Empxtrack team provided solutions to overcome several complex issues, including shift management, capture of attendance data in real-time, accurate calculation of overtime for each employee, identification of late comers, and provide employees option to compensate short hours with their manager’s approval. With the automation of the process and implementation of Empxtrack, the team handled all complex issues. Managers are able to check the total number of employees present in a specific shift. 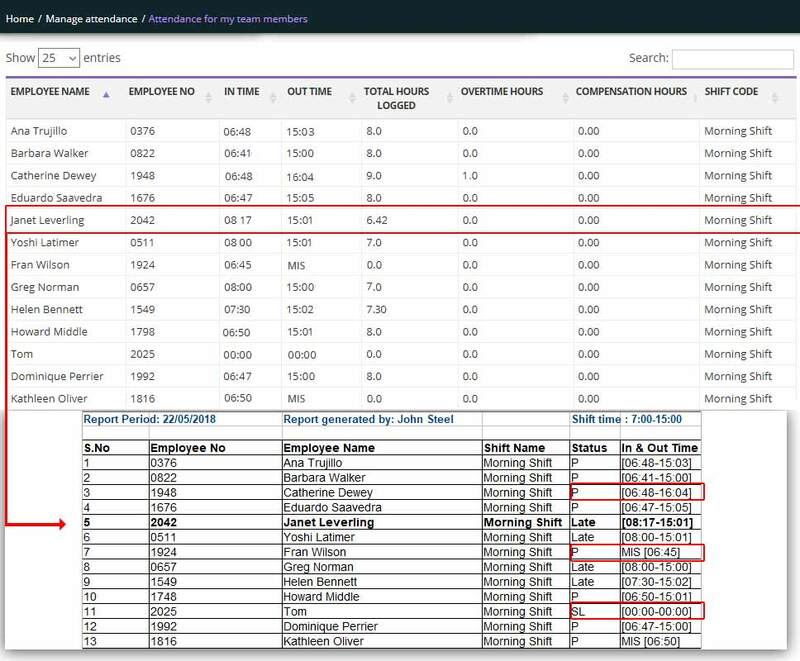 Company used Empxtrack attendance and shift management module to record in-and-out time of each employee. System highlighted late comers, absentees, overtime and short hours for individuals. It made easy for managers to pull real-time attendance data of their team members in a single click. 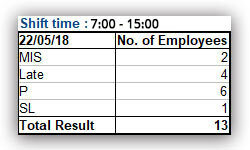 Image 1: Identify late comers and early goers, and record their short-working hours. Janet, Yoshi, Greg and Helen are the late comers. SL shows Sick Leave. There is only one absentee on 22nd May 2018. MIS shows Mispunch for employees who haven’t marked their Out-Time on the online attendance portal. An employee, Catherine, has worked for 9 hours. Her overtime is 1 hour. 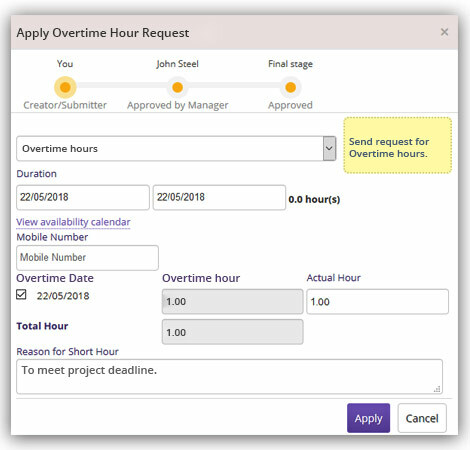 Managers get an easy way to manage overtime hours. They can use the system to approve overtime requests of their subordinates as per workforce requirement in the shift. Image 2: Employees can send request for overtime. Catherine applied the request asking her manager to work for an extra hour on 22nd May 2018 to meet project deadline. Manager can respond on Catherine’s request after checking the availability of work station on the specific date. Employees get an option to request their manager to compensate short hours. Image 3: An employee can send request to compensate short hours. The manager approves the request depending upon the shift requirements. 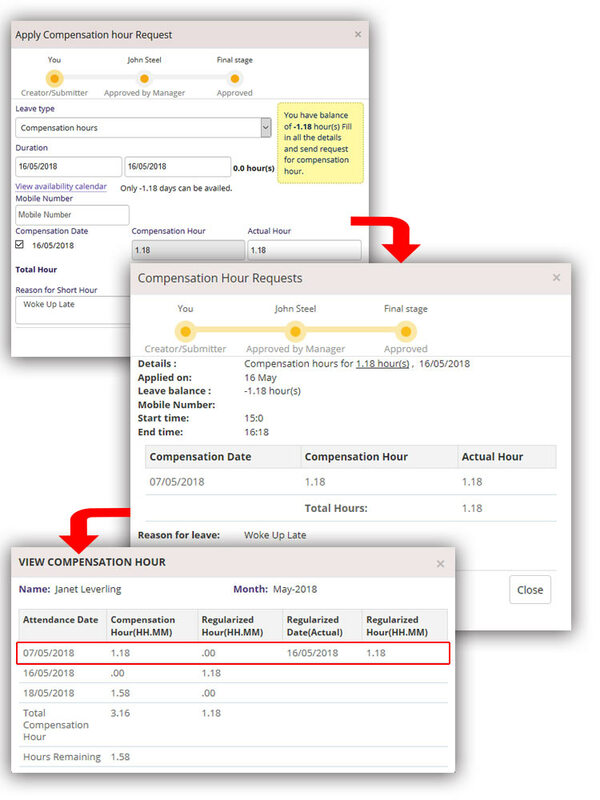 Once the employee compensates the committed hours, it gets regularized in the database. Earlier, managers used to compile time-consuming reports on their own to check attendance records of their subordinates. The automation of the process made it easy for Managers to capture and analyse attendance data on their system in a click of a button. Managers analysed data in a timely manner to take necessary disciplinary action for employees for frequent absences and short working hours. Image 4: Managers can get a consolidated report of absentees, late comers, and total number of employees present in a shift. Optimum utilization of workspace by keeping all work-stations occupied for maximum time. Manager can see real-time attendance data for his entire team in just one click. Know availability of present employees and late comers along with their actual punch time. Identify employees who have short working hours in a month and provide them an option to compensate their short hours before the next payroll cycle. Organization offers flexibility in work schedules by providing options to compensate short hours. Better visibility and easy tracking of employee work hours. Manage complex shifts for large set of employees with a single click. Better discipline in the organization. Increased returns on infrastructure investment.